Companies face many challenges when attempting to gain better control of their Human Capital Management (HCM) systems and data and ensuring their company is compliant with employee benefit regulatory requirements. Recently, Business Process as a Service (BPaaS), business process over the cloud, has become a very popular answer to organizations’ search for a solution to ACA compliance which takes into account the rapidly changing government regulations, the strain on IT resources and lack of internal knowledge concerning the Affordable Care Act (ACA). BPaaS delivers industry-level expertise and services for ACA Compliance. BPaaS is an type of process where the services delivery is based on cloud service models. BPaaS includes and uses SaaS, PaaS, and IaaS. These cloud services include Software as a Service (SaaS), Platform as a Service (PaaS), and Infrastructure as a Service (IaaS); and are therefore dependent on these cloud related services. The BPaaS comes on top of the cloud service. While most major HCM and payroll vendors provide a software solution to administer Affordable Care Act (ACA) data, these ACA modules often do not provide all of the steps the ACA reporting business process requires, therefore leaving a gap in the service delivery model. This gap could range from Form 1095 printing to eFiling to the IRS. BPaaS for ACA fills these gaps, efficiently and smoothly. Below is a summary of the processes required to complete ACA Reporting and Efiling to the IRS to achieve compliance. The BPaaS process enables a user to select any or all of the processes as their requirements demand. Since they pay for only what they need and use; the solution is very economical. Using the BenefitScape BPaas is simple, provide us your XML, indicate the services you will need and our expert analysts will take it from there. 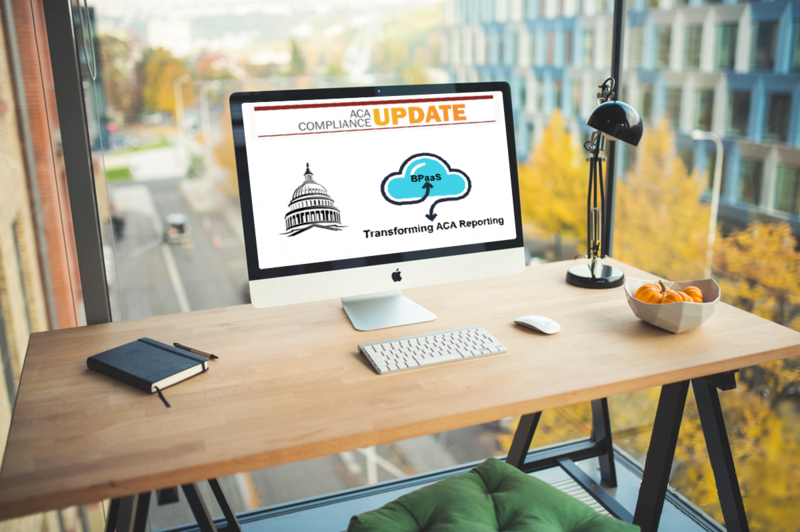 ACA Compliance 2017: How to use BPaaS to help! The IRS has encouraged all Applicable Large Employers (ALE's) of any size to file electronically. An ALE providing more than 250 Form 1095 reports must file these forms electronically. Organizations with fewer than 250 Form submissions may file their IRS report in paper hard copy but with an earlier deadline requirement, currently February 28, 2018. Use the services of an authorized IRS efiler and IRS AIR transmitter such as BenefitScape. Employee Benefits Compliance requires complex reporting, such as Form 5500 and Form 1094/1095. The significant changes to the 5500, such as the new Schedule J for Group Health Information, will require close coordination and sharing data with ACA reporting — which is not going away soon. Many employers may believe that “ACA Repeal” will mean that Form 1095 ACA reporting and filing will disappear... This is incorrect. The time to prepare for TY2017 Reporting is now. Strict deadlines are coming as early as Feb. 1, 2018. Under current law and under both proposed Congressional Repeal bills (House and Senate Versions) the IRS requirement to report remains unchanged. This means that your clients need to file Form 1095 for Tax Year 2017. Contact us to see how we can help you keep up to date and help you remain in full compliance. At BenefitScape we recognize that all employers are very unique. They have very distinct organizational structures, different types of employees, supported by the functional areas involved in Healtcare ACA reporting, such as payroll, benefits, legal, IT, HRIS and finance. Because your organization has unique requirements, you need to find a customizable solution to satisfy your ACA reporting obligation. BenefitScape is the most flexible economical solutions provider in the ACA Compliance arena. We have the clients, the references, the experience and the technology to prove it!